Eugene A. Permyakov received his PhD in physics and mathematics at the Moscow Institute of Physics and Technology in 1976 and defended his Doctor of Science dissertation in biology at Moscow State University in 1989. From 1970 to 1994, he worked at the Institute of Theoretical and Experimental Bio-physics of the Russian Academy of Sciences. Since 1994 he has been the Director of the Institute for Biological Instrumentation of the Russian Academy of Sciences. He is known for his work on metal binding proteins and the intrinsic fluorescence method. His primary research focus is the study of physico-chemical and functional properties of metal binding (especially calcium-binding) proteins. Robert H. Kretsinger received his PhD in biophysics at the Massachusetts Institute of Technology under the supervision of Alex Rich in 1964. In 1967 he set up a protein crystallography lab in the Department of Biology at the University of Virginia, where he¿presently teaches, and determined the crystal structure of parvalbumin as well as describing the EF-hand domain in 1971. He has subsequently investigated the structures, functions, and evolution of various EF-hand homologs, along with other protein families. From 1978 to 1995, he directed a national facility to build multiwire area detectors for x-ray diffraction and to collect data from protein crystals. 2. 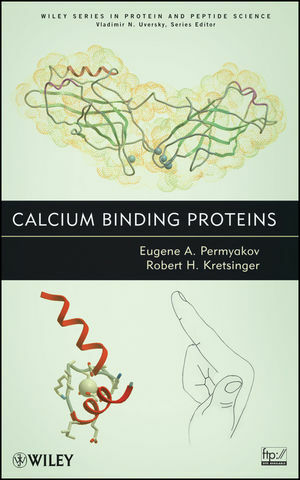 Physiological Processes Involving Calcium Binding Proteins. 3. Comparison of the Ca2+ Ion with Other Metal Cations. 4. Complexes of Calcium and Other Cations with Low Molecular Weight. 5. Stoichiometry, Kinetics, and Thermodynamics of Calcium Binding. 6. Experimental Methods Used to Study Calcium Binding to Proteins. 7. Structure and Evolution of Proteins. 8. Protein Complexes with Metals Other than Calcium. 12. Cytosolic Calcium Binding Proteins Lacking EF-Hands. 13. Extracellular Calcium Binding Proteins. 14. Interactions of Calcium Binding Proteins with Other Metal Ions. 15. Interactions of Calcium Binding Proteins with Other Proteins and with Membranes. 16. Genetic Engineering of Calcium Binding Proteins.